This is original high quality product with 2-year warranty. We do not sell Chinese imitations. Need assistance? E-mail or call us at +420 222 743 723 or +1 360-469-0472. Latest FiCOM version is ? 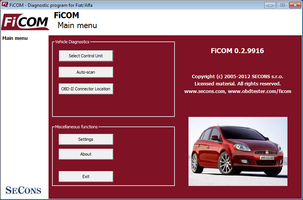 FiCOM is diagnostic software for Fiat, Alfa, Lancia and light Iveco vehicles. It covers also other vehicles made in cooperation with Fiat such as Maserati, Ferrari, or Ford Ka II (for full FiCOM coverage please visit this page). 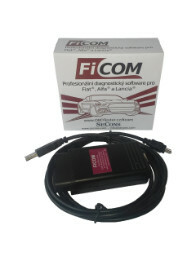 FiCOM comes with smart OBD2 to USB interface which contains multilpexer for both K-Line and CAN-BUS communication. This means that interface works fully automatic without need to hassle with jumpers, switches, or wires. Supported protocols include KW71, KWP2000, ISO15765 with extended IDs and extended addressing. The software is very easy to use. We also tried to maintain compatibility with Fiat Examiner Smart, wiTECHplus and Iveco EASY/Eltrac where possible. Full ECU coverage listing is available here. You'll get: FiCOM OBD2 USB interface, USB cable, quickstart sheet. All this packed in a box. Software download online (software on CD-ROM on request only, the software outdates very quickly, so please consider if you really need installation media). Everything is packed in bubble-mailer and all shipment are 100% insured. For more information see global product order page. We provide standard 2-year warranty for our products. Adapters are optional accessory only if you need to diagnose vehicles without OBD2 socket. Existing customers who have purchased FiCOM diagnostic interface before 2015 can upgrade their interfaces by placing order on FiCOM interface upgrade page. Important notice: in order to use FiCOM odometer correction module, you already need to have our FiCOM diagnostic interface or purchase module along with FiCOM above. The module does not ship - you will be able to download it via Internet after we receive your payment. Please use our contact form to get more information about FiCOM odometer correction module. Please use our contact form to get more information about FiCOM. Click here to see program screenshots. Read why should you buy our products.